Why is that? 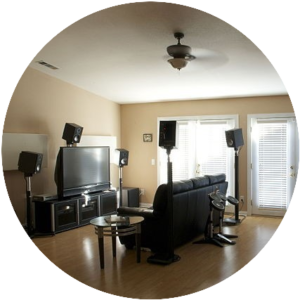 take a look at the results that it brings you in the case of know how much comfort and luxury it offers to those who dare to take on a great entertainment center of relaxation and fun. Remember it’s all about the comfort and style when it comes to premium theater sofa features. Seat has built it’s name on customer satisfaction for many years and continues to come. Just when you though it’s not possible to have this much design and style that tailored to fit your lifestyle guess again. Seatcraft takes the time to understand the customers needs and wants and gives it’s best product that designed to deliver for years to come . This makes sense to know you have a theater seating company that truly cares about the needs of the customer and delivers on promises. Seatcraft takes things to a whole new level for theater seating comfort, but it’s has made much more strides towards a new level of technology by inter grading it into it’s lines of furniture for premium comfort, and luxury which could stand the biggest test of time by offering a rock solid warranty to back up it’s promise for quality. Premium Leather Gel: Designed to give you extra cushion and is made with polyurethane leather that sits on top of fabric to give you soft plush feel to the touch. Do you get the idea of this, it’s crafted by design to help enrich your life with fine quality. Adjusted Powered Headrest: Imagine your seat has the power to give you a massage by a lick of a button. Now it’s possible to have the that and the ability to recline all by the push of a button. It’s more to this than what your thinking. The simplicity of it makes it so much more of an opportunity that claims more. USB Port: worried about losing out on the movie due a phone charge? fear no more, Seatcraft has the USB Port installed right on side of the seat and on the center console to help you in the most needful ways to keep your devices charged. Wireless Charging: If you tired of charging devices with a wired device, then go wireless as well. Just place it on the top of the charging pad and get back what you do best. Tray Tables in Armrest Storage Container: Does anyone have trouble keeping popcorn from spilling? or how about getting a better place to store the controller so it’s out of site but still within your grasp? 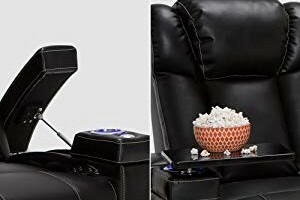 This recliner set just keeps on delivering on convince You can store your things inside a large storage container and rest the popcorn on top of the tray table that folds out to use. The Features will leave you convinced that it’s a must see and must try recliner set that continues to deliver on comfort, quality and style that lasts for decades to come. Technology infused with these leather sofa set can make things that much hard to leave your seat which is more than. Enough to know that it can make things better every time you sit in one of these. The delivery might make things a little difficult and could pose more issues than you think. It also has to be assembled to which means you may have to use tools that is not included with purchased. it’s not the most durable leather to have which could lead to you checking a testing the texture to see if it’s what you are looking for in a leather theater seat.